The group has implemented a wide range of energy-reduction initiatives to reduce GHG emissions. These include communication, monitoring and reporting as well as operational initiatives such as the efficient maintenance of vehicle fleets using the latest clean-engine technologies from OEMs. Other initiatives include the installation of renewable energy and the purchase of carbon credits within certain operations. Our approach, includes adaptation and mitigation strategies aimed at transitioning to lower carbon economies. These are embedded in our operations and included in our customer solutions offered. Barloworld is committed to reducing its emissions footprint have set group aspirational 2020 targets. While progress against targets may not be linear over the target period, it is monitored and reported annually as part of the group’s integrated reporting. Indirectly we reduce emissions by using less electricity and, directly, by using fuel more efficiently in our vehicles as well as in our building heating ventilation and cooling systems (HVAC). Car Rental (Avis Budget) South Africa’s customer rental emissions generated are classified as scope 3 emissions and have been disclosed from our 2010 financial year. These emissions have been expanded to cover rental fleets from other operations during the 2013 financial period. While the expanded reporting has resulted in more complete data being reported internally, these are not included in the disclosed scope 3 – rental fleet emissions data in the current reporting period. Car Rental South Africa’s scope 3 emissions have been included in the external (limited) assurance scope of review performed by Deloitte and is reflected in our external disclosures. Emissions identified by Barloworld include carbon dioxide, nitrous oxide and methane from combustion of petrol and diesel in trucks, machinery, equipment and vehicles, and from purchasing grid electricity. This is in line with the nature of our operations and the sources of our emissions. There are no significant ozone depleting substances as emissions sources in Barloworld’s operations. Barloworld does have other non-Kyoto protocol greenhouse gas emissions sources, namely oxides of nitrogen (NOx) and oxides of sulphur (SOx), given the nature of its automotive operations. Measures to mitigate these non-greenhouse gas emissions rely on consumption of low sulphur fuels and advanced engine technology for cleaner fuel combustion. These measures are outside the control of Barloworld although they are adopted and used internally where feasible. The group completed the for use as a tool to understand its carbon footprint, identify associated risks and opportunities, contribute to general knowledge and global database, and identify further interventions to reduce emissions. Mindful of our responsibilities in our value chain, a number of initiatives have been implemented to assess and limit any potential risks emanating through our supply chain. We have assessed our principals that account for some 45% of our procurement spend, for environmental, labour, human rights, bribery and corruption, and corporate citizenship risks. These principals have been assessed as low risk for each of the aspects above. However, we remain aware of the well-publicised Volkswagen and Audi emission issues which affected diesel customers internationally. We are monitoring this situation and recognize associated risks. The Volkswagen and Audi vehicles sold by us in our territory meet the local South African emissions compliance standard, and our operations have consequently not been directly impacted. The group focuses on scope 1 and scope 2 emissions, respectively caused by consumption of fossil fuels and grid electricity generated from fossil fuels. These are reported in terms of the GHG Protocol Corporate Standard and converted to units of tCO2e being the universal unit of measure adjusted for the global warming potential of the Kyoto Protocol greenhouse gases. The emissions identified by Barloworld include carbon dioxide, nitrous oxide and methane from combustion of petrol and diesel in trucks, machinery, equipment and vehicles, and from the consumption of purchased grid electricity. Aligned with our decrease in energy consumption (-5%), group emissions (scope 1 and 2) are 5% lower than 2017 levels. Diesel is the major contributor (65%) of total 2018 group carbon emissions. Despite grid electricity only constituting 9% of 2018 group’s non-renewable energy consumption, grid electricity contributed 28% to the group's 2018 total carbon emissions. While 2018 revenue (proxy for activity) increased by 2% over prior year, scope 1 emissions (diesel, petrol, CNG, LPG and Heavy oil) decreased by 4% and scope 2 emissions (grid electricity) decreased by 6% over the same period. It may not always be possible or practical to reduce absolute energy consumption and resultant carbon emissions, year-on-year given the correlation between business activity and energy consumption and carbon emissions. To mitigate against this, Barloworld measures carbon emissions against activity levels (tracking revenue as a proxy for activity), resulting in an intensity indicator. At a group level an aspirational target of a 10% efficiency improvement in greenhouse gas emissions (scope 1 and 2) has been set for the end of our 2020 financial period, off a 2015 baseline. Our 2015 baseline was selected as it coincides with our strategic planning period. While the aspirational target is set for the end of our 2020 financial period and may not be linear over the target period, progress is monitored and disclosed. In line with our operational footprint and revenue by region, South Africa contributed the majority of our group emissions footprint and was some 95% of group scope 1 and 2 emissions in 2018. Emissions from diesel accounted for some 65% of group scope 1 and 2 emissions footprint in 2018. Consistent with our financial reporting boundary, we adopt the financial control approach for our non-financial reporting boundary. Emissions from our rental fleets are classified as scope 3 emissions. There are minor biogenic emissions stemming from biodiesel combustion. We are refining our reporting and calculation methodologies in this regard and will appropriately disclose in due course. For more detail see also Barloworld Energy and Emission conversion factors. The group focuses on scope 1 and scope 2 emissions, respectively caused by consumption of fossil fuels and grid electricity generated from fossil fuels. These are reported in terms of the GHG Protocol Corporate Standard and converted to units of CO2e being the universal unit of measure adjusted for the global warming potential of the Kyoto Protocol greenhouse gases. While 2018 group revenue (proxy for activity) increased by 2% over prior year, scope 1 emissions (diesel, petrol, CNG, LPG and Heavy oil) decreased by 4% and scope 2 emissions (grid electricity) decreased by 6% over the same period. Given our wider activities and the nature of our products and solutions, during the year we continued measuring and reporting certain scope 3 emissions. This covers emissions from business air travel and from the South African car rental operations. We recognise that emissions from our car rental activities are central to our customer offerings and strive to reduce these by providing fuel efficient fleets for rent. Car rental operations in South Africa produced 109 540 tCO2e (2017: 113 689 tCO2e) of scope 3 emissions, an absolute year-on-year decrease of 4%. Emissions from rental fleets are impacted by distance travelled per rental. Avis Budget South Africa provides invoices that indicate emissions related to the rental. Avis Fleet Services also reports emissions to their customers, and it is anticipated that this information would also be relevant to other Barloworld rental fleets in future. Emissions from the Car Rental fleet are calculated based on the distance travelled and the respective vehicle OEM emission factor. This has been included in the limited assurance review conducted by the group’s external assurance provider, Deloitte. We have implemented processes to record emissions from our other significant rental fleets. These are however reported internally at this stage. Once we are confident with data accuracy and completeness our intention is to include these fleets in our reported scope 3 emissions. We strive to provide our customers with solutions that assist them to achieve their sustainable development, including climate change, objectives. While no specific targets are set in this regard as customers’ requirements vary, this however forms part of our mitigation and adaptation approach in transitioning to lower carbon economies. Emissions from business air travel is calculated based on the average distance per long, medium and short haul flights multiplied by an emissions factor. The intensities reflected below are a function of carbon emissions and activity. The decreased 2018 emissions (scope 1 and 2) intensity against 2017 indicates less carbon was emitted in generating R1 million revenue than in 2017. It may not always be possible or practical to reduce absolute energy consumption and resultant carbon emissions year-on-year given the correlation between business activity and non-renewable energy consumption and carbon emissions. The above intensity decrease in 2018 is reflective of the 5% decrease in emissions (scope 1 and 2) versus a 4% decrease in the number of permanent employees (including contractors greater than 12 months) over 2017. While 2018 group revenue (proxy for activity) increased by 2% over prior year, group emissions are down 5% on 2017. Our commitment to improving energy efficiency in terms of fossil fuels and the resulting GHG emissions is reflected in being an early signatory to South Africa's Energy Efficiency Accord and more recently the South African National Business Initiative's (NBI) Energy Efficiency Leadership Network's (EELN) Energy Efficiency Pledge. Targets are incorporated into our strategic planning process and the ongoing management of the business, including performance scorecards. Greenhouse gas emissions are intimately linked to non-renewable energy consumption across the group. As a result, the key driver of reduced emissions is more efficient energy consumption. It may not always be possible or practical to reduce absolute energy consumption and resultant carbon emissions year-on-year, given the positive correlation between business activity and non-renewable energy consumption and carbon emissions. To mitigate against this, Barloworld measures carbon emissions against activity levels (tracking revenue as a proxy for activity), resulting in an intensity indicator. The intensities reflected below are a function of carbon emissions and activity. Energy conservation and consequently emission reductions are driven by the group's aspirational target of a 10% efficiency improvement in our non-renewable energy consumption and greenhouse gas emissions (scope 1 and 2) by the end of our 2020 financial year off a 2015 baseline and against a business-as-usual scenario. The emission intensity in 2018 is 7% lower against 2017, which indicates less carbon was emitted in generating R1 million than in 2017. In addition to the above intensity monitoring and through the use of savings models, revenue (proxy for activity) and actual consumption, indicative unit and financial savings can be calculated against a business as usual (BAU) scenario. 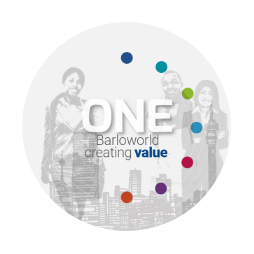 Inclusion of 'Sustainability' to its core Values, which recognises that it is central to our value creation approach and emphasises the individual responsibility of all in Barloworld for this aspect. Included under Sustainability is 'We focus on environmental responsibility and preventing waste'. Adopting various Energy Management Systems and ISO certifications in certain operations which include procurement management, measurement, account verification initiatives, load management, energy efficiency initiatives, alternate energy projects, monitoring, rebates, reporting and communication and training. Reduce business travel and introduction of company car schemes that support transition to lower engine capacities. >Within the Automotive's Motor Retail operations, initiatives implemented at 9 sites are anticipated to produce an estimated cumulative saving of some 1 000 MWh of grid electricity (scope 2) per annum, resulting in a reductions of some 2 200 GJ and 1 000 tCO2e. Occupancy sensors implemented at one warehouse has contributed to year-on-year savings of some 150 000 KWh (approximate saving of 540 GJ and 155 tCO2e) in FY18. 77 Smart trucks have been deployed across three provinces that are capable of transporting sugar, timber and platinum. During the year, these vehicles have transported the same payload while doing some 8 844 less trips within the period. This saving equates to an estimated reduction of 2 150 098 kms and a saving of some 1.2 ML of diesel and 3 196 tons of emissions (approximately 45 744 GJ). This initiative has cumulatively, from September 2012 to September 2018, allowed Barloworld Transport to reduce the number of trips by 21 300 trips, resulting in an estimated saving of 3.2 ML of diesel and a reduction of approximately 8 900 tons of emissions (approximately 121 900GJ). In addition to the 300 kW (peak) solar photovoltaic installation implemented at Equipment's Isando operations in FY16, a further 400kWp was installed during the current period; one at our Boksburg Power facility (200kWp) and one at our BRC facility (200kWp). These installations have contributed to the generation of some 950 MWh of renewable energy during the period and translated into an avoidance of 980 tCO2e resulting from grid-electricity and a monetary savings in excess of some R1m for the financial period. Similar installations are anticipated for selected facilities in the future. Switching to renewable energy reduces reliance and pressure on the electricity grid and improves operational resilience. Avis Budget South Africa purchased Voluntary Emission Reductions (VERs) (13 435 tons for 2018) to the value of approximately R0.7 million. The VERs were purchased through Nedbank Capital and sourced through the Johannesburg Landfill Gas to Energy Project. Consideration is being given initiatives aligned to Greenstar level 4 and 5 ratings for property developments under way. Given the nature of our operations and the sources of emissions, there are no significant ozone depleting substances as emissions sources in Barloworld's operations. Barloworld has other non-Kyoto protocol GHG emissions sources, namely oxides of nitrogen (NOx) and oxides of sulphur (SOx), given the nature of its automotive operations. The volume of emissions resulting from these sources is considered to be immaterial which is in line with the nature of our operations. Measures to mitigate these non-greenhouse gas emissions rely on the consumption of low-sulphur fuels and advanced engine technology for cleaner fuel combustion. These mitigating measures are outside the control of Barloworld. These emissions are difficult to quantify given diverse operating conditions, technologies and regions in which the group operates and are not considered to be material. For indicative purposes, the group has calculated the emissions relating to the following gases which are those that the group operations produce, namely Methane (CH4) and Nitrous Oxide (N2O). Group figures for 2018 are 136 tons and 2 103 tons for CH4 and N2O respectively. In total these amount to 2 239 tons which is 0.87% of the group’s scope 1 and 2 emissions for the reported period and are therefore considered immaterial.